At this restaurant, unexplained sights and sounds abound. It was the Colye family home in the 1800s, and according to legend, young Johnny Colye fell in love with his family’s hired girl. When she didn’t return the feelings, he killed her in the barn, and was eventually arrested and hanged for the crime. His grave is said to be on the property. Both Johnny and the girl he murdered (thought to be named Molly) are said to haunt the restaurant to this day. Witnesses have reported hearing music and voices, and objects are moved, doors slammed and dishes broken by the prankish Johnny. 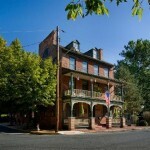 One witness, an inn employee, reported seeing the two apparitions in an upstairs storage room. I AM A MUSICIAN WHO PLAYS AT THE ACCOMAC VERY OFTEN. ONE NIGHT I WAS SPEAKING WITH ONE OF THE WAITRESSES IN THE REAR OF THE DINING ROOM, WHEN I HAD TO MOVE OVER AS SOMONE WALKED RIGHT NEXT TO ME AS IF LEAVING THE ROOM. I SAID “OH EXCUSE ME”…AND THE WAITRESS LOOKED AT ME AND ASKED WHY I SAID THAT…I SAID BECAUSE I WAS VERY CLOSE TO THE PERSON WHO JUST WALKED BY ME….SHE LOOKED AT ME VERY SERIOUSLY AND SAID THAT NO ONE HAD JUST WALKED BY ME…NEEDLESS TO SAY THE HAIR ON THE BACK OF MY NEXT WENT UP IMMEDIATELY. This place is real deal in my opinion. Took my 10yo son, 13yo daughter, and her friend on a little late night ghost tour. Checked this place out. It was about 230am. Very quiet right by the river. Heard a few strange noises, then started taking pictures of the windows hoping to catch orbs or anything. I took a few back to back shots of the 2nd floor window at the front of the place. First one showed nothing, next 2 showed a white shadowy figure. Last one was a figure and face clear as day. Saw the pic and showed the kids. Needless to say they freaked out! I wanted to show my wife the pics when we got back but somehow all the pics on my phone slowly became corrupted starting with these. Either a very strange coincidence or they didn’t want to be seen. I won’t forget it though! There’s no denying someone’s still there. Awesome deal are you able to share the photo? 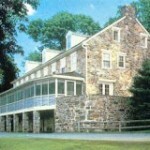 I am the Lead investigator for the Northeastern Paranormal Association (NEPA) We frequently investigate the Accomac. The girls name is actually Emily Myers who Johnny Coyle killed. The grave stone for Johnny is located adjacent to the Accomac property and is accessible with a little climb of a step hill. We have collected multiple EVPs, shadow figures, orbs and a possible picture of Emily. We have been the host of the Ghost Dinners they have for the past 4 years. I suggest if you get a chance stop by for amazing food and great ghost stories. Monday May 29th my girlfriend and I were sitting in the parking lot of the Accomac doing a spirt box session and got a lot of Emily talking and crying out for help.